Me Llamo Dora: An Explorer in Modern America Animated heroine, beloved of preschoolers throughout the U.S., breaks the cartoon mold: She's Latina, bilingual, a tomboy — and she knows how to get problems solved. NPR's Rolando Arrieta explores how Nickelodeon's scrappy heroine came to be. 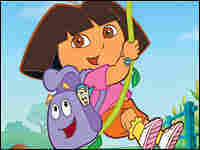 One of Dora's closest companions is her talking backpack, an essential item for any young explorer. Braving new environs, Dora and her pal Boots the Monkey make their way to Star Mountain. 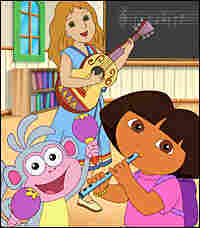 Dora and her maraca-shaking monkey learn music from their Maestra de Musica, who also instigates plenty of sing-alongs. 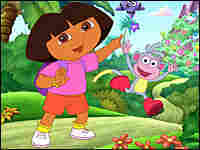 For nearly a decade, Dora the Explorer has been part of the daily routine for millions of preschoolers and their families. 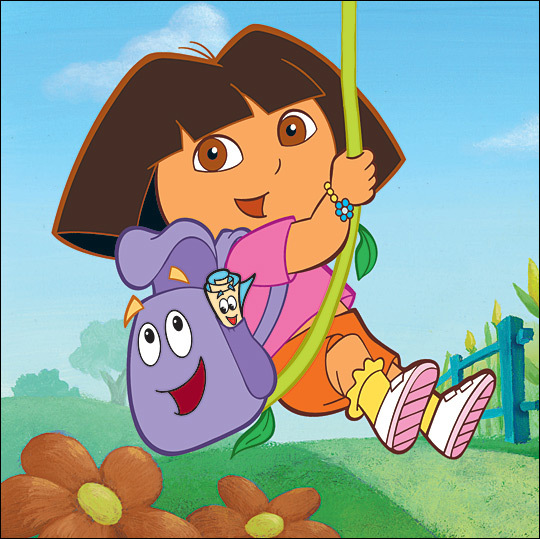 The animated adventure, starring a fearless 7-year-old Latina with a talking backpack, is the most popular show among kids ages 2 to 5. When Dora made her debut in the summer of 2000, the Nickelodeon cable channel had already been successful with interactive programming for kids, and executives asked producer Chris Gifford to create yet another. With his colleagues Eric Weiner and Valerie Walsh, Gifford set out to engineer a character who could motivate kids to participate. They tried several animated characters — a squirrel, a martin. One promising idea: a bunny. "It was a bunny who would go on a trip with his mommy," Gifford says. "But it wasn't a bunny for very long." That's because his boss, Brown Johnson, was thinking of something altogether different. She said forget the animal ideas and make the character a Spanish-speaking Latina. Johnson, it turned out, had recently been to a conference on media, race and gender — where she learned that Latinos aren't terribly well represented in children's television. And she was out to change that. "One of our goals with Dora was to position the whole idea of being multicultural as being super-special," Johnson says. 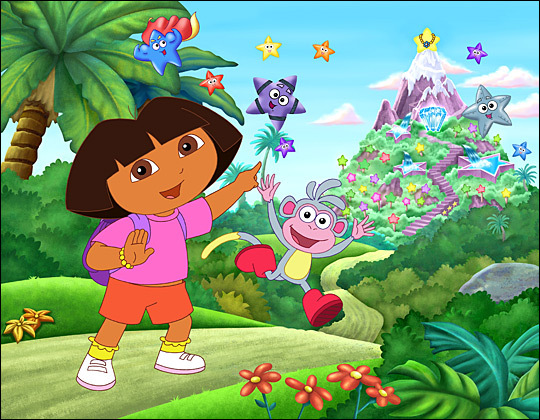 The plan for the show that became Dora the Explorer had always involved the idea that kids would go on a make-believe journey. Along the way, Gifford says, they would face obstacles and learn strategies to overcome them. The idea was to have kids ask for help throughout the show, preparing information and using it strategically in the story. And as the concept evolved and the show's star took shape, Nickelodeon executives themselves had plenty of questions. What would this Latina character look like? What would she wear? Taking a cue from their heroine, Gifford and Johnson asked for help. "We must have more consultants in this show than any other show in the entire universe," Johnson says. Schoolteachers, sociologists, historians and cultural and language experts were all brought in to help. Mistakes were still made, however — like when Gifford & Co. came up with the character Tico, one of Dora's friends. "Tico was always sleepy," says Johnson. "Asleep under a tree. Our cultural consultant said, 'Not such a good idea.' A Latino character, who only speaks Spanish, the littlest character, always asleep. Just not a good idea." But from where would Dora trace her heritage? The creators and consultants decided she wouldn't. "We framed her more as a pan-Latino character, so she can be a source of pride and identity for anyone of Latino background," says Carlos Cortes, a history professor at the University of California at Riverside. Cortes wrote the book Children are Watching: How the Media Teach About Diversity. He says Dora's being pan-Latina also meant the writers needed to choose Spanish words carefully. "For example," he says, "make sure the words we're using were universal. Not Spanish terms that meant one thing in Cuba and something else in Mexico and something else in Peru." About a year and many iterations later, a smart, 7-year-old problem-solver named Dora Marquez was born. Why the name Dora? The Spanish feminine word for "explorer" is exploradora. 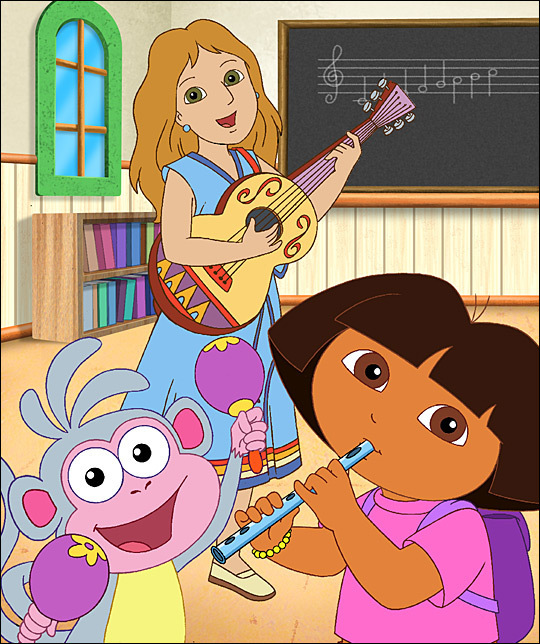 Dora's surname is an homage to the acclaimed writer Gabriel Garcia Marquez. And when it came to sketching the way Dora looked, the creative team made sure she wasn't stereotypically Latina. "Short hair," Gifford says. "Not long, flowing hair. A little more tomboyish; a girl who was more interested in adventure and exploring than someone who thought a lot about what she looked like." Gifford knew kids would like her look. He and his team produced a pilot and showed it to a group of preschoolers. Sure enough, he says, they loved it. Preschoolers screen all Dora episodes before they air, and they can be a tough audience. They tell it like is. "It's awful," Gifford says. "It can be so scary. The 3-year-olds come at you, and you're just petrified." As a father, Gifford believes that Dora the Explorer is what all parents want their daughters to be. "She's courageous," he says. "She's kind. She's got unbelievable interpersonal skills." Some parents might also find her a little annoying — when she encourages kids to yell, for instance. Despite all that, however, Dora the Explorer just might be the first icon for the children of a new America — a country that is today about 14 percent Latino.